Why is cleaning your scale or measurement equipment important? Regularly scheduled preventative maintenance is the easiest way to extend the life of your scale or measurement equipment. While most forms of preventative maintenance should be performed by a measurement equipment expert, you can perform cleaning on your own. Keeping your measurement equipment clean allows it to function properly by keeping compartments, junctions & electrical components clear of obstruction. 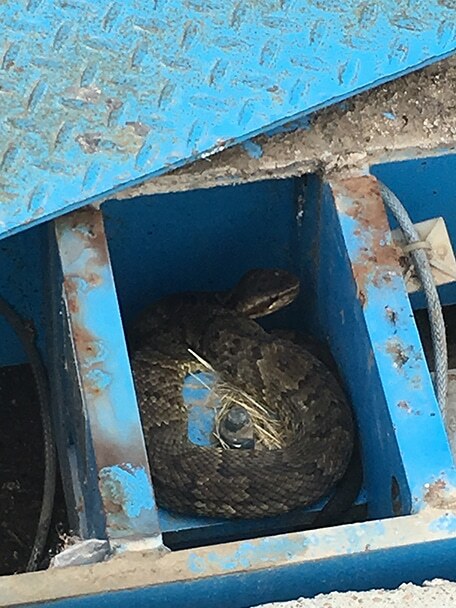 Not to mention, regularly checking your scale for debris can help you identify potential problems sooner, like this snake, which was hiding inside of the junction box of a truck scale in Houston, Texas. Customers often ask how to properly clean their weighing & measurement equipment, and how frequently to do so. There are a few factors to take into consideration when developing a measurement equipment cleaning schedule. The environment in which the equipment is being used will dictate how often cleaning needs to occur, as it will determine how messy things get on a daily basis. For example, weighing & measurement equipment inside of a shipping facility will require cleaning much less often than equipment used at a food processing facility. Legal requirements, spills & the need to disinfect regularly are factors that necessitate frequent cleaning in a food processing environment. Those factors don’t exist in a shipping facility, so less frequent cleaning would be required. The task for which the weighing or measurement equipment is being used also affects how often it requires cleaning. For example, let’s imagine 2 analytical balances are being used in a laboratory. Scientists may use one lab balance to measure liquid ingredients before combining them to make medicine, and the other lab balance to measure solid pills for quality control purposes. The laboratory balance being used to measure the liquids will probably require cleaning more often than the balance being used to measure pills in dry, solid form. The material that makes up your scale or measurement equipment will determine the proper cleaning method. If your unit is made of stainless steel, it is “washdown safe”, as is required in food safe applications, and can handle direct contact with water. Otherwise, it’s best to apply any sort of cleaner, water included, to a clean cloth, and then use the cloth to wipe down the equipment. Quick guide to cleaning your scale or measurement equipment. 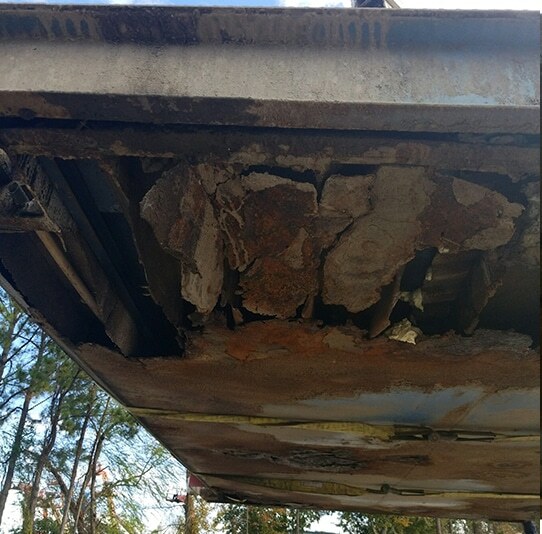 Truck scales are especially susceptible to debris build-up, and should be cleaned regularly. 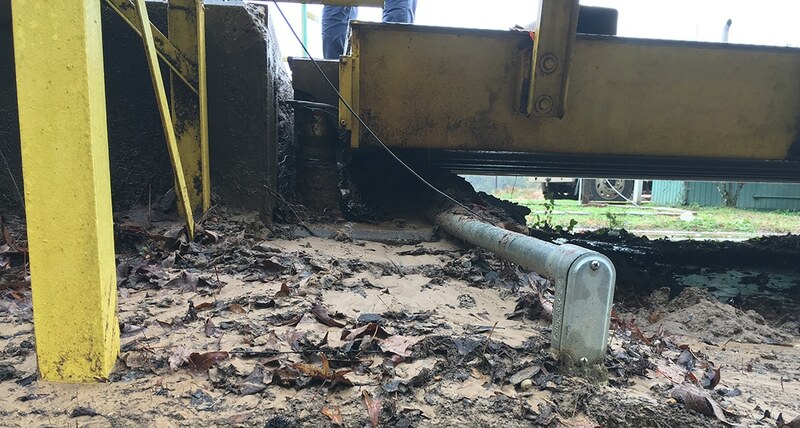 It’s very important to keep the entire scale clear of debris, including the top surface or deck, junction boxes, and especially underneath the scale. 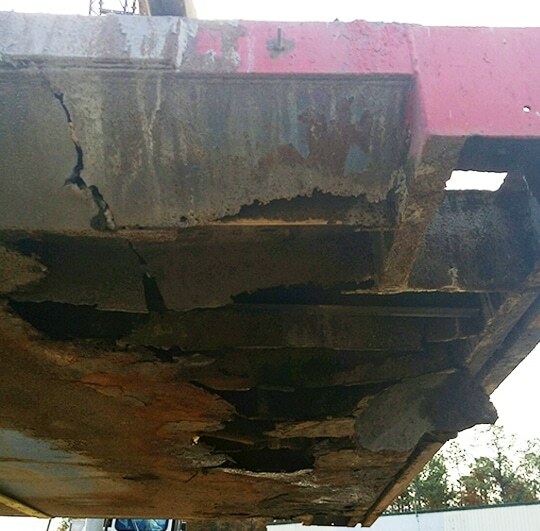 Below are images from a truck scale, which rotted through as a result of failure to clean the debris from underneath the scale. Even steel can be damaged over time by dirt, mud & the elements. Regularly inspect the truck scale for debris. Use a broom or hose to remove debris from the top & sides of the scale deck. Use a hose to wash away any mud, dirt or debris that may be piling up under the scale. If the debris has already piled up, as you can see in the photo below, use a shovel to dig out the area under the scale. The scale cannot function properly without sufficient room for the deck to rise & fall freely when in use. To clean a floor scale, carefully lift the scale and clean debris away from it with a broom. For more intense cleaning of a floor scale that is not washdown safe, use a cloth to wipe down the floor scale with soap & water, or another form of mild cleaner. To clean a washdown safe floor scale, you can scrub the scale down with soap and pour water over the scale to remove any dirt, oil or debris. To clean a bench scale, carefully remove the top pan. Clean the scale & pan by wiping it down with a damp cloth. You may also add soap to the cloth, then wipe away with a clean cloth. The cleaning process is similar with a washdown safe bench scale, except you can pour water over the scale, or use a hose to remove dirt, oil & debris. To clean a lab balance, use a mild cleaner & a soft cloth. Apply the cleaner to the cloth only, and wipe away any material that may have spilled onto the balance, or splashed against the shield. The material that caused the mess will dictate the appropriate type of cleaner to use. Wipe away the cleaner afterward with a soft cloth. If your lab balance is washdown safe, repeat the process above, but rinse the cleaner away from the balance instead of using the cloth. The most efficient way to clean a scale indicator is to apply a foaming cleaning product, then wipe away & continue wiping until the screen is clean. The Michelli service team has tested all sorts of cleaners, and found that a foaming bathroom cleaner is the best way to clean the indicator. It will remove oil, residue & grime. Check back often for additional tips on how to get the most out of your weighing & measurement equipment, and follow us on Linked In or Twitter to make sure you never miss important news from Michelli Weighing & Measurement. Ready to schedule a preventative maintenance service? We’re here to help! Contact us today for sales, service or help maximizing your efficiency.